A battery powered boiler tube beveling tool that delivers the same power as a pneumatic beveler but is truly cord-free, making it ideal for quick welding end preps is available from Esco Tool of Holliston, Massachusetts. The Tube Weasel Battery MILLHOG® is a right angle drive I.D. clamping welding end prep tool featuring an 850 Watt motor with a proprietary gear reduction system that delivers high torque at 43 RPM. 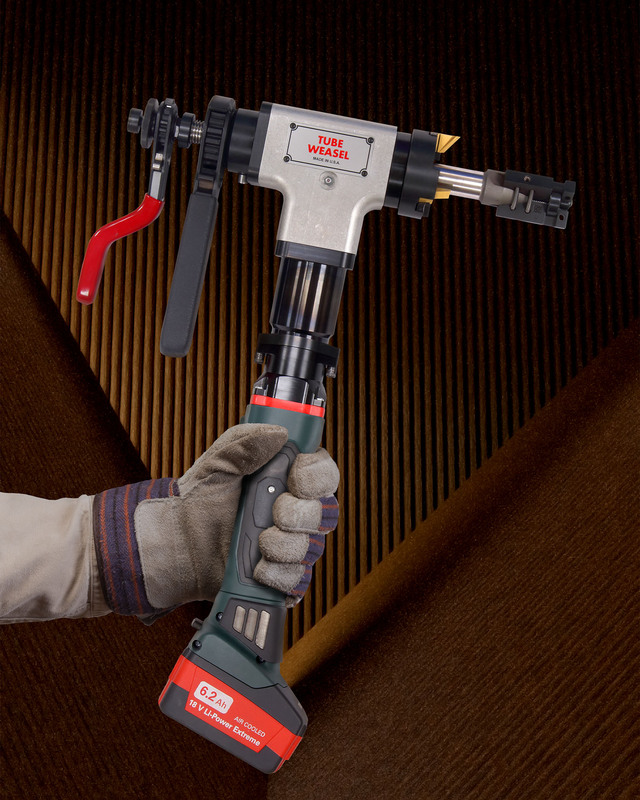 Capable of pulling a thick chip without cutting oils on tubes prone to work hardening at high speeds, this battery powered end prep tool is ideal for quick repair jobs. Ideally suited for beveling SS tubes with a high chrome content and high nickel percentage tubes, the Tube Weasel Battery MILLHOG® is equipped with a 6.2 Ah 18 V rechargeable Lithium-Ion battery and employs TiN coated cutter blades mounted in a wedge-style blade lock system. Designed for tubes from 3/4″ I.D. to 3” O.D., it only requires a 3” radial clearance. The Tube Weasel Battery MILLHOG® is priced from $4,195.00 complete or is available for rent. Literature and pricing are available upon request.